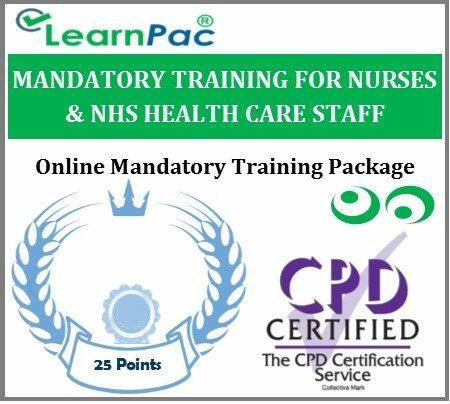 Welcome to LearnPac Systems’ mandatory training courses for nurses and NHS health care staff package for healthcare and social care providers. This mandatory training courses for nurses and NHS health care staff package was developed to meet the requirements of commissioning organisations, Care Quality Commission (CQC) and other regulatory and professional bodies in the UK. Whats included in this mandatory training courses for nurses and NHS health care staff package? LearnPac Systems works with thousands of NHS and private sector providers of healthcare and social care services. This mandatory training courses for nurses and NHS health care staff package was to meet the requirements of NHS Trusts, private hospitals, recruitment agencies, locum agencies and other health and social care providers. This mandatory training courses for nurses and NHS health care staff package covers all the essential statutory and mandatory training subjects in line with Care Quality Commission (CQC) requirements. Who is this mandatory training courses for nurses and NHS health care staff package for? Our mandatory training courses for nurses and NHS health care staff package is suitable for nursing and health and social care staff. This mandatory training package is also suitable for all healthcare and social care professionals, whether they work part time of full time in NHS Trusts, private hospitals and other health and social care providers. Locum and agency workers, including doctors, allied health professionals, nurses, healthcare assistants and health and social care support workers should also complete mandatory and statutory training courses in line with their job roles. What are the benefits of the mandatory training courses for nurses and NHS health care staff package? The majority of NHS Trusts, private healthcare providers, nursing agencies, locum and other health and social care agencies now insist that healthcare and social care professionals working in their organisations should complete mandatory and statutory training that is aligned to the Skills for Health UK Core Skills Training Framework (CSTF). This mandatory training courses for nurses and NHS health care staff package is aligned to the requirements of Skills for Health’s Core Skills Training Framework. How do I book for the mandatory training courses for nurses and NHS health care staff? You can book for the mandatory training courses for nurses and NHS health care staff online. 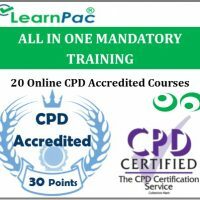 Just click ‘Buy Now’ in the top right hand corner of this page to order your mandatory training courses online. Follow the instructions to complete the order. Once you complete your online order, you will receive a confirmation email within a few minutes. You will also receive a separate email providing you the link to you mandatory training courses online and login details. You should then be able to immediately access your online mandatory training portal and complete you statutory and mandatory training modules. Mandatory training is a a compulsory requirement that places responsibility on medical, nursing and healthcare staff to work in a safe manner. The core training modules in the mandatory training courses for nurses and health care staff are appropriate in depth to the level of understanding needed. Mandatory training differs from statutory training in the sense that mandatory training requirements are set by the organisation (healthcare or social care provider) to ensure that their employees are competent to reduce occupational risks, follow national guidelines and comply with their local policies and procedures. On the other hand, statutory training is required by law or a statutory body such as the Health and Safety at Work etc. Act or regulators such as the Care Quality Commission (CQC). Statutory bodies and health and social care regulators can instruct healthcare and social care organisations to meet specific legislative requirements through mandatory and statutory training. What are the regulatory requirements for mandatory training? Professional organisations such as the General Medical Council (GMC) and the Nursing & Midwifery Council (NMC) and the Health and Care Professions Council (HCPC) provide regulatory support and guidance regarding mandatory training for doctors, registered nurses and allied health professionals (AHPs). The Royal College of Nursing (RCN) has also provided guidance on the differences between mandatory training and statutory training. It is important to note that mandatory training requirements may differ for medical, nursing and healthcare professionals may differ depending on the NHS or private sector settings where they work. The Care Quality Commission (CQC) can take regulatory action if healthcare or social care providers do not meet the CQC Regulation 18 requirements. The CQC Regulation 18 requirements state that health and social care staff must receive support, training and personal development necessary for them to carry out their job role. Employees that have completed mandatory training courses previously should undertake annual updates or refresher training to ensure they have the knowledge and understanding of changes in legislation and directives. Annual refresher training intervals will vary depending on the organisational requirements. Skills for Health have created the UK Core Skills Training Framework (CSTF) for healthcare employers which provides guidance, mapping tools and learning outcomes to improve quality, reduce costs, track progress, consistency and standardisation of training. Whats the best way to deliver mandatory and statutory training? There is no wrong or right way to deliver mandatory training courses for nurses and NHS health care staff. Mandatory training can be delivered to a group in a classroom environment such as a training centre by an experienced trainer. It may cover cover both the theory and practical elements or focus on practical elements only (with theory having been completed online or in a previous session). 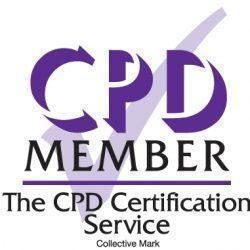 We highly recommend that all healthcare and social care providers should assess their employee training needs, establish the most suitable learning styles, noting any skills gaps and then identify the most appropriate training delivery methods. In most cases these the core statutory and mandatory training modules are required for all staff, for example ‘health and safety at work’, ‘safeguarding adults/children’, ‘equality, diversity and human rights’, ‘moving and handling’ among others. The additional mandatory training courses will depend on the individual job roles and the level of knowledge required for staff to work efficiently and safely. 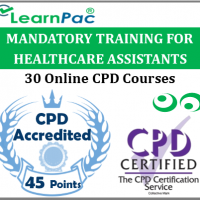 LearnPac Systems lists a wide range of mandatory training courses which are suitable for NHS workers such as nurses, doctors and dentists. These training courses are also beneficial to health and social care staff working in the social care setting such as a CQC registered care homes, residential homes or domiciliary care agencies. Can the mandatory training courses for nurses and NHS health care staff be used for NMC revalidation?